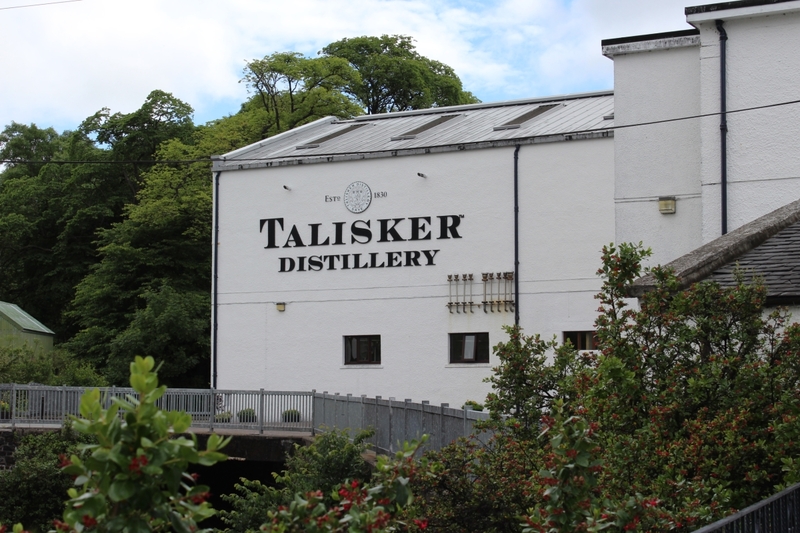 Touring Talisker was a real treat. It wasn’t terribly cheap, but following the extremely informative tour and thorough tasting, I’m happy to report it was worth every pence. I have to give an enormous kudos to Talisker for their employment of exceptionally good tour leaders. Our guide was knowledgeable, patient, and captivating. Our guide, talking whisky and rowing. She managed to strike a wonderful balance of fine details and more general knowledge, which appealed to both me and my girlfriend who is far less interested in the ins-and-outs of scotch production. There was no cameras allowed around the stills themselves (hence the absence of pictures), but at Talisker, we were told the shape of their stills (with a unique two bends in their pipe) is largely responsible for the character of the whisky. Worm tanks used for condensing the whisky. The one contemporary touch was the recent addition of seawater cooling, to offset fresh water use during (rare) dryspells on Skye. While these happen so infrequently it wasn’t sure if the new pipes would be used for years, Talisker found itself requiring them only last month, proving their immediate value. In essence, touring Talisker gave me the refreshing sense of a distillery committed to tradition, but unafraid to adopt modern techniques where necessary. I knew we would be tasting whisky, but I was pleasantly surprised with the range and depth our guide took us for the tasting. I was stunned by just how good the (very strong) unaged expression of Talisker was. It had so much character – including Talisker’s lovely peatiness — it put other white dog whiskies I’ve tried to shame. It also served as a useful baseline for the rest of our comparisons. The 10 held up amazingly well compared to its more mature kin. I also learned that Talisker’s flagship whisky was originally aged only 8 years – but was changed to a decade after Talisker was included in the “Classic Malts” list, where 8 would have made it the youngest whisky included. I was a little underwhelmed by the Distiller’s Edition, which seemed to me a flatter, less potent expression, possibly to pander to more sensitive palates. I’m happy to say the 57° North impressed again. A few members of my group were a little leery of the “No Age Statement” but our guide spoke strongly in favour of it – with the caveat it be used for making great whisky not bound by age, as opposed to increasing production. At the end of the tasting, about half our group (myself included) voted for the 57° North as the best expression we’d tasted. 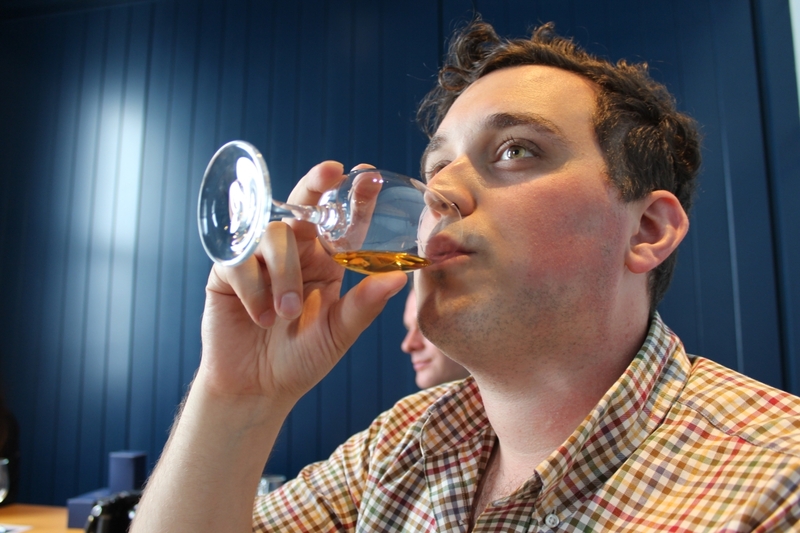 Me, sipping on some of the Talisker 25. The Talisker 18 was outstanding. Really mature, and it had developed a depth of flavor with almost earthy undertones to the bright salted caramel top notes. If you’ve got the money and you’re looking to spend it, you could do far worse than the 18. It was easily my second favourite and gave the 57° North a run for its money. But as for the 25, I was quite disappointed. Far less rich in character than the 18, the 25 was almost approaching Speyside levels of subtlety. Which is all well and good, but Talisker’s unique flavor is what makes it so appealing to me. And I feel some of that was lost on the 25. That said, it was far and away my girlfriend’s favourite (and about half of the group,) so I can’t write it off completely. 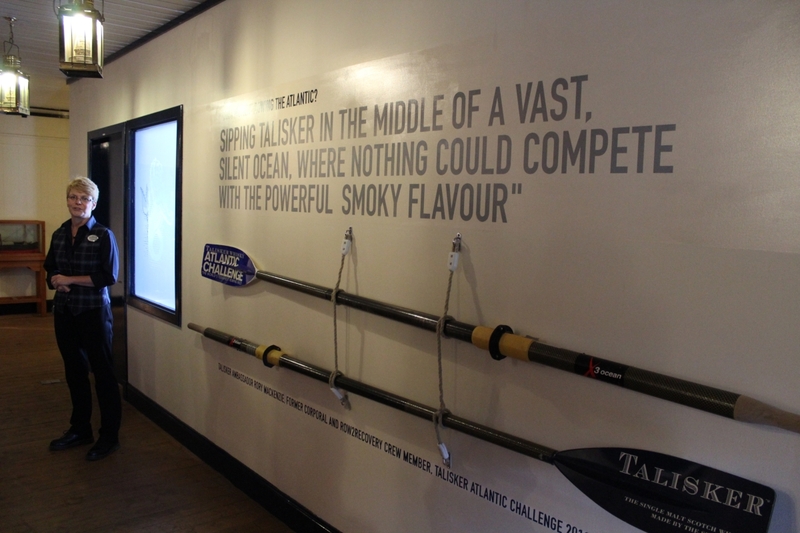 If you’re looking for a top-notch distillery experience in Scotland, you’d do well to try touring Talisker Distillery. Both my girlfriend and I had a lovely time, and the price was well worth the experience. 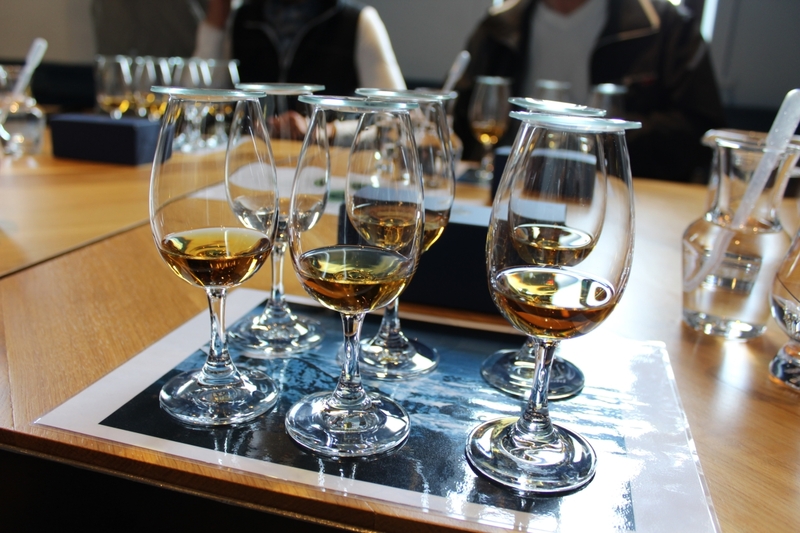 The tasting was the perfect cap to the afternoon, and the range and quantity of whisky was very generous. We even got to take home a Talisker branded nosing glass, included in the cost of the tour! I highly recommend this tour as a chance to sip some fine Talisker slow. 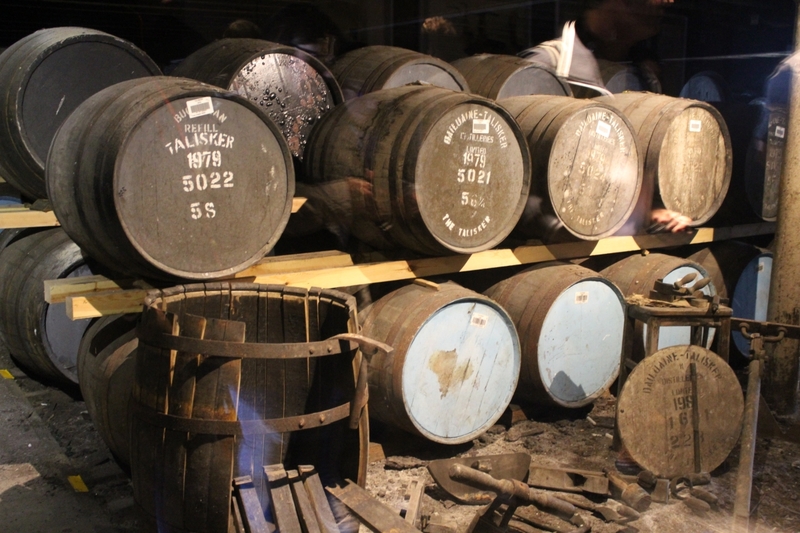 Very old barrels of scotch — waiting for their moment to shine. Thanks Hudson, glad you enjoyed it! Sounds really nice! Was it hard to get to the distillery? I’m thinking of going but we have to be able to get there from an airport. Well written and great photos! Thanks so much! We drove there from Glasgow airport, and found the drive difficult but doable. On Skye, there are plenty of “Single Track Roads” which I highly recommend you research before attempting.